Treat your FJ to a brand new Mikuni BS36 carburetor assembly. 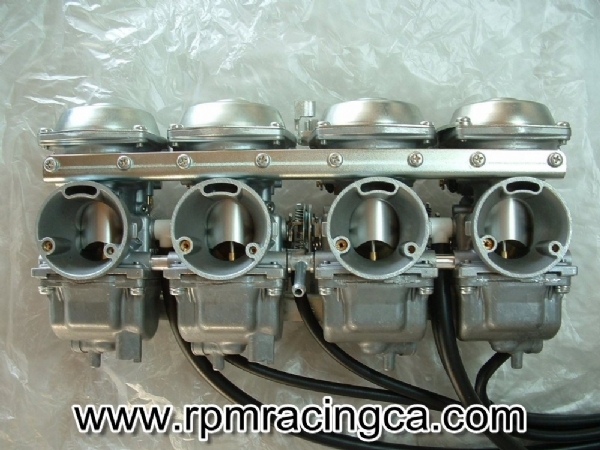 These carbs are brand new and are set-up for the 89+ fuel pump single inlet fuel pump design. They are Yamaha factory jetted and non-adjustable main jet needle. Many new FJ owners will find when they get an FJ, the carbs have been "worked on" by the previous owner, and the cost or repair will exceed the cost of a new set. Plus when you start off new, you have a solid foundation to tune to your desired riding style & performance. I manufacture a replacement fitting to replace the center fuel tee after it is removed when converting over to gravity feed set-up. The only other change will be to replace the fuel pump brass needle seat with your gravity feed version. With the info I provided these carbs arrived, bolted them on and were spot on.